The fence that divides your lawn from the sidewalk is the first thing visitors see when they pass by, so make it count. 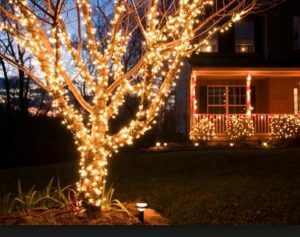 It you have a convenient power source, icicle lights create a glittering cascade that can brighten up your entire property line. These work best on fences with straight tops. For curved fences, consider hanging a garland of greenery instead. You can add some tiny, white lights to these for a subtle glow, or spruce them up with pine cones, bows or even decorative fruit instead. Light up your walkway for Christmas with specially designed light stakes. These can be easily pushed into your lawn to hold up strings of lights along straight or curved paths. Some light stakes are individually lit and come in festive designs as well. Be sure to consider how much snow you expect so you can set your lights at the right height — they won’t do any good buried in a snow bank! You can also add potted evergreens or topiaries along your walkway for a natural look. These can be decorated with lights like Christmas trees, or you can simply add a large red bow to each. Any tree looks better with lights at Christmas time! Classically shaped conifers look best when you make them look like traditional Christmas trees, so pull out those strings of lights and start wrapping them around your evergreens. For large spruce trees that have been limbed up, try hanging outdoor ornaments from the lowest branches instead. 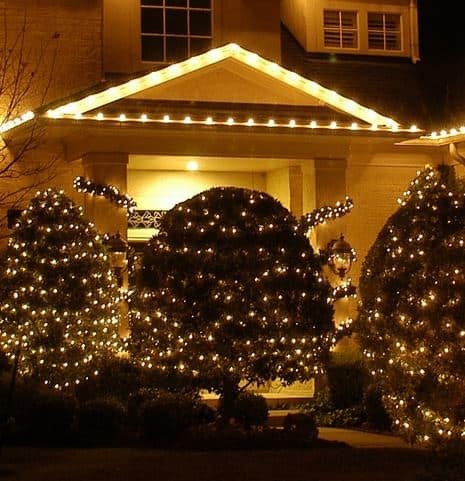 Deciduous trees that have lost their leaves can also look lovely with lights. Highlight their architecture by wrapping the trunk and largest branches in strings of lights to outline the shape of the tree. Moravian stars also look lovely hanging from the branches. Though you can always wrap bushes with strings of lights, draping a bush with a net of lights yields a brighter result. 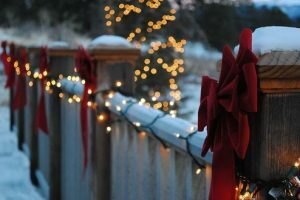 You’ll be able to decorate quickly by simply placing the lights on top in one motion, and the netting has more lights per square inch than you’ll get with a traditional light string. If you have delicate shrubbery that needs to be protected from the elements in the winter, wrapping them in burlap is a classic solution. For the holidays, you can add ribbon and bows to make them look like presents — it’s a fun way to make the most of something you have to do anyway! Have fun turning your yard, garden and home into a Christmas Wonderland this season! Happy Holidays for everyone at the Bur Han team!